Interlibrary loan provides you with resources from other libraries when UVic does not hold the item you need for your study or research. Are you a UVic undergraduate or graduate student, faculty or retired faculty, staff, or affiliate? Are you an external library borrower? If you're not affiliated with the university, you can use our Distance Learning and Research office to order books and articles for a fee. This includes institutions, organizations, businesses and individuals. Interlibrary loan is a free service to request items not held by the UVic Libraries. 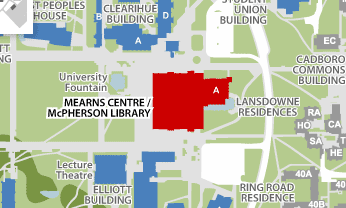 How do you know if UVic Libraries holds an item? When you are in the catalogue, click the “Not @ UVic?” tab. This will take you to a page to request an item from another library. You can also access this page from request an interlibrary loan under the popular links menu in the right hand column of every web page. When requesting an item, the title is a required field, however, the more information you add, the better chance there is of your request being successful. The Interlibrary Loan Office is located in Room 292 on the second floor of McPherson Library. Staff are happy to answer your questions. The due date is on the wrapper of the item. Please do not remove the wrapper. Where do I pick up my interlibrary loans?